The world of urban economics is quietly revolutionized by the flurry of new software and data available that make what-used-to-be-painful-GIS-processing a simple(r) process. Take for instance the analysis of land cover statistics — the data is provided by USGS and gives land use by 30mx30m cells –. The data is now easy to download, but is also quite easy to process in R. The R “raster” package allows for the computation of zonal statistics by census tract, block, ZIP, or any polygon in a scripted way. Hence papers like Urban Sprawl (in the Quarterly Journal of Economics) should now be easier to replicate and update. Economics as a field is however quite resistant to making code publicly available on the web. Although sharing code could allow replication and thus enhance the credibility of new research, each academic has quite strong a incentive to protect his/her turf. This sort of prisoners’ dilemma hinders creativity, and we could imagine a world where code and data sharing on a wide scale would unleash a torrent of new creativity. For now, each researcher has a close group of contacts with whom he shares his privately-developed techniques. Not the best way to ensure that economics as a science makes sound progress. On the data front, the arrival of geolocalized information from Twitter — which has been around for a few years now — has not yet led to a vast trove of new research papers. This is likely because Twitter users are a self-selected sample of the population. But Twitter data is also potentially rich in information: for instance, the striking correlation between race (black/white) and iPhone/Android use in Kansas City east and west of Troost avenue could be worth an in-depth look. Troost avenue has divided Kansas City along racial lines long before the advent of the Internet. Finally, another thought on data use: developing countries typically have less data than the US and the Nordic countries but the advent of internet data — such as Open Street Map, twitter, global land cover — could unlock some interesting analysis of developing countries, without relying on national statistical institutes. The future of geographic economics research is fascinating but right now the task is to use such advances in information technology in a way that answers the big questions of economics: where is activity located? why are there cities? why are households sorted in space? why are jobs not located where households live? should metropolitan areas build more roads or improve their public transport infrastructure? 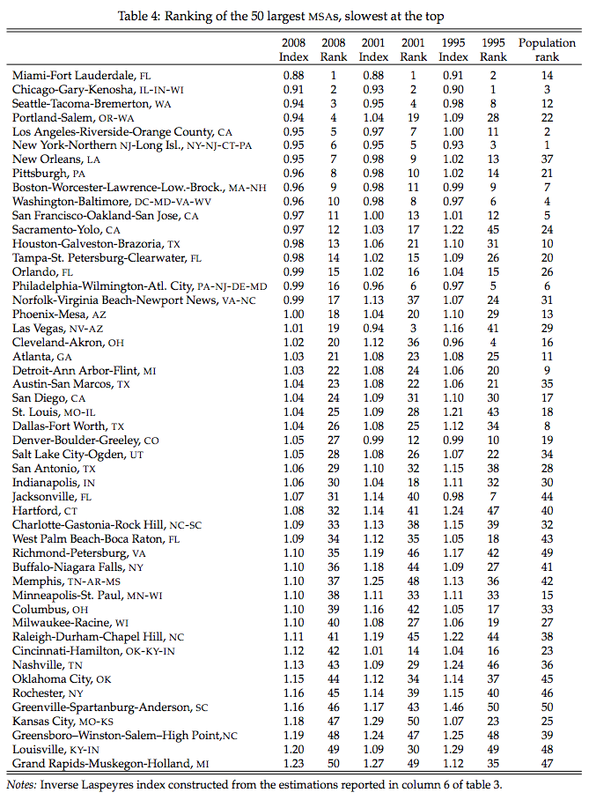 Which are the fastest and slowest (car-wise) U.S. metropolitan areas? The task of comparing speed across U.S. cities is daunting: First, data on car trips is sparse. Second, just ranking cities by the average speed (in km/h or miles per h) of trips is not a good way to spot the fastest and slowest U.S. cities. Indeed, in the fastest cities, households tend to use their car more! Hence just comparing the average speed of a trip in, say, Miami, FL with the average speed in Grand Rapids would likely overestimate the speed difference between those two cities. Victor Couture, Gilles Duranton, and Matthew Turner solve these two issues. First, they use two large surveys of household trips — such data includes the trip’s purpose, its duration, and its length. And second, they estimate the demand for car trips as well as the supply. In their paper, the authors build a metropolitan area speed index. Miami is the slowest city, while no other city than Grand Rapids (!) is the fastest city in the United States. Data: National Household Transportation Survey. I was in Bangalore, India, last week. Bangalore is a very intriguing city, where high-end luxury thrives right next to extreme levels of poverty. Where a US educated surgeon operates in a hospital that supplies its own electricity. Where luxury suburban communities are isolated and segregated, supplying their own local amenities — theater, restaurant, swimming pool, temple — and local infrastructure — security and roads. Bangalore suggests that in India the private sector succeeds despite extremely weak governance processes — corruption is rife, construction is slow. Despite such hurdles, pristine malls emerge in neighborhoods where no proper road is maintained. Infosys, the Indian IT giant, is actually located outside the city, in Electronic City. It has set up its own set of infrastructures — including electricity supply. Bangalore’s population is exploding (+65% in the last 10 years, +23% in the 1990s), but the municipality struggles tremendously to adjust its supply of public goods to population levels. Population growth led to a hard-to-manage urban sprawl, where rural migrants and educated middle-class Indians settle, hungry for jobs. Nevertheless, without proper infrastructure management, the future of Bangalore as a thriving business center is at stake.